It is outdoor movie season, so please call as far in advance as possible to reserve an outdoor projection screen for your family or group movie night! Call AVIVA Rental Systems at 804.353.9212 or e-mail our Event Director at doe@avivarentals.com today! 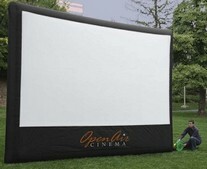 Outdoor movie nights are great attractions for winery events and for garden clubs during garden week! Or play video games under the stars. The kids will love it! Easy to move, easy to store, easy to inflate, an outdoor projection screen is a great way to combine summertime outdoor activities with everybody's favorite indoor activity, watching a movie! This summer, show the kids a little bit of what it was like at the drive-in when you were young with a backyard movie party! Or, combine the movie with a pool party or a barbeque for the entire neighborhood! Get the neighbors together and beat movie theater ticket prices and expensive concessions and create great memories for your kids! Perfect at golf courses! Use golf carts as the cars! Yes, it will need to be dark for the projected image to be viewable. That is why show time starts at sunset. What time is sunset? At AVIVA, we keep track of what time the sun sets with Weather Underground. For maximum impact, AVIVA recommends the 16'x 9' Open Air Home Screen (H16), with wide screen, 16:9 aspect ratio and an 18' diagonal projection surface, pictured in the upper right corner. The 18' diagonal Open Air Home Screen comes with a Koala Airpower blower that inflates the screen in less than 20 seconds. The Open Air Home Screen's intelligent design provides optimum tension for the projection surface without the work of tying, clipping or zipping on a projection surface. Please remember, inflatable screen rentals do not include the projector or speakers! Also, be aware that when inflated, these screens will act like sails in the presence of wind, even when tethered down (straps included). If the weather calls for appreciable amounts of wind, we advise clients to select a location for the screen where the wind's impact can be blunted or diminished, i.e., against the wall of a building, garage or a fence. The original Backyard Big Screen is a recipe for family fun and now you can enjoy movies like never before, right in your own backyard. Try dinner and a movie! Featuring built on legs and feet, it can easily be set up wherever you need - in the backyard, at home, or for professional presentations. 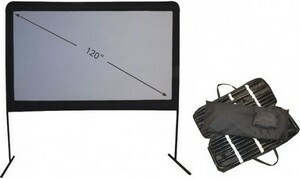 Our large 120" screen features a rugged and reliable frame and can be setup easily in minutes. Tensioned so that it creates a tight, flat screen for optimal viewing. Made of special materials to enrich colors and enhance contrast. The black-backed gray screen helps block out light from behind, which helps improve overall image contrast ratio. It also includes stakes and guy lines to tie it down, if needed. The original Backyard Big Screen is perfect for movies at home, business seminars, sporting events, weddings and much more. Please remember, all outdoor screen rentals do not include projector or speakers! Also, be aware that when inflated, these screens will act like sails in the presence of wind, even when tethered down (straps included). If the weather calls for appreciable amounts of wind, we advise clients to select a location for the screen where the wind's impact can be blunted or diminished, i.e., against the wall of a building, garage or a fence. Of course, AVIVA can also assist you with the projector and the audio for your movie! Hook your laptop up to the projector to show your favorite movie on a Blue Ray DVD player! Also great for video remembrances at weddings, anniversaries, birthday parties and reunions! "Good morning. Thank you for providing the AV equipment for our Food Show this week. Everyone was very impressed with you all and we would love to utilize your services again next year."